JERUSALEM (AP) — It took time, but Israeli police detectives have finally cracked one of the country’s greatest crimes — the legendary heist of a priceless clock collection from a Jerusalem museum a quarter century ago. The 1983 theft, the costliest in Israel’s history, saw 106 timepieces worth millions of dollars disappear from the L.A. Mayer Museum for Islamic Art. Among them was a pocket watch made for French queen Marie Antoinette that museum officials value at more than $30 million. Although the stolen clocks had no connection to Islamic culture, they were displayed in the museum because they had originally belonged to the father of the museum’s founder. The heist baffled police for more than two decades. But detectives now blame Naaman Diller — a notorious Israeli thief who fled to Europe and died in the United States in 2004. 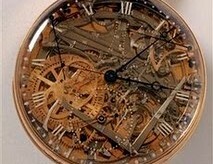 Investigators got their first break two years ago, when the museum informed them it paid some $40,000 to an anonymous American woman to buy back 40 of the items, including the Marie Antoinette timepiece made by famed watchmaker Abraham-Louis Breguet. Rachel Hasson, the museum’s artistic director, calls the gold and rock crystal watch “the Mona Lisa of the clock world.” Also recovered were a Breguet creation from 1819 known as the “Sympathiques” and a clock shaped like a pistol from the same period. Police forensics experts were allowed to examine the clocks, and detectives questioned the lawyer who negotiated the sale. The trail led to an Israeli woman in Los Angeles named Nili Shamrat, who police identified as the widow of Diller — a notorious criminal in Israel after a string of bold thefts in the 1960s and ’70s. From there the mystery began to unravel, police say. Diller apparently confessed the crime to his wife on his deathbed. When Israeli police and American law enforcement officials arrived at her home last May to question her, they found more of the stolen clocks. Police placed a gag order on the case, but lifted it last week after Israeli media violated the order. Diller’s widow refused to answer questions from The Associated Press when contacted Saturday, and did not answer her phone Sunday and Monday. Her Israeli lawyer, Hila Efron-Gabai, also refused to discuss the case. Oded Yaniv, one of the investigators who broke the case, said about 40 clocks are missing, but police are pursuing tips on where Diller scattered the goods around the world. Yaniv called the investigation a “once in a lifetime” experience, filled with international intrigue in the murky world of art dealing and antiquity trading. Diller was renowned in Israel for daring break-ins and an ability to keep one step ahead of the law. He meticulously researched sites for hours and used innovative techniques that earned him the admiration of the same people who were trying to stop him. According to police, Diller used a crowbar to bend the bars on a back window of the museum the night of April 15, 1983, and behind the cover of a parked truck climbed inside with a ladder. Having staked out the museum, he knew the alarm was broken and the guard was stationed in front. Police spokesman Shmulik Ben-Ruby said Diller was very thin and able to slither in and out of the opening unnoticed throughout the night. He said the clocks were generally small enough to easily pass through and Diller had the expertise to take others apart if needed. The spokesman said police had thought of Diller as a possible suspect in 1983 but found nothing to link him to the robbery. In addition, police thought the heist was the work of a gang of at least three robbers. Yaniv said he and his colleagues were shocked to discover Diller acted alone. Diller later moved to Europe, where he operated under several identities and was briefly jailed before moving to Los Angeles, where he died of cancer. Hasson said she was ecstatic to get at least part of the collection back and plans to have the clock display open again within the two months. She said the museum purchased the watches back for a “symbolic” fee after Diller’s widow tried to sell the stolen goods elsewhere and failed. “The clocks are so well-known that nobody would buy them,” she said.